Where do we learn whom we should perceive negatively? We often think that as long as a white person doesn’t fly the Confederate flag, use the n-word, or show up to a white supremacist rally that they aren’t racist. However, researchers at Harvard and the Ohio State University, among others, have shown that even whites who don’t endorse racist beliefs tend to be biased against non-whites. This bias, though, is implicit: it’s subconscious and activated in decisions we make that are faster than our conscious mind can control. You can test your own implicit biases here. Millions of people have. But where do these negative subconscious attitudes come from? And when do they start? The Kirwan Institute for the study of race and ethnicity has found that we learn them early and often from the mass media. 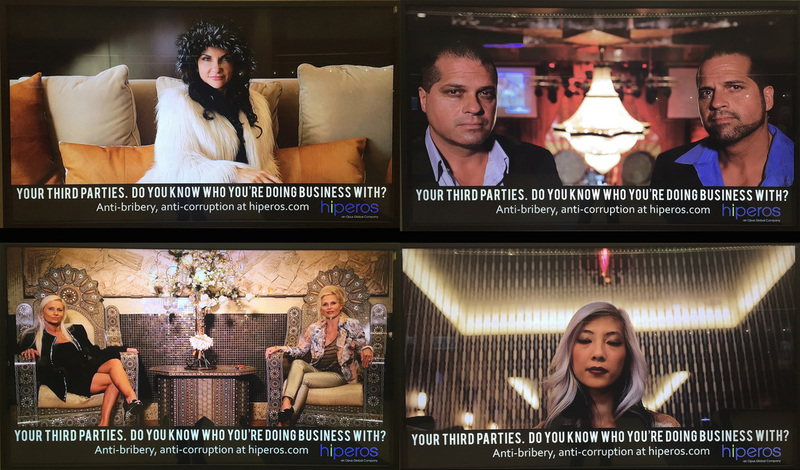 As an example, consider this seemingly harmless digital billboard for Hiperos, a company that works to protect clients against risk online. 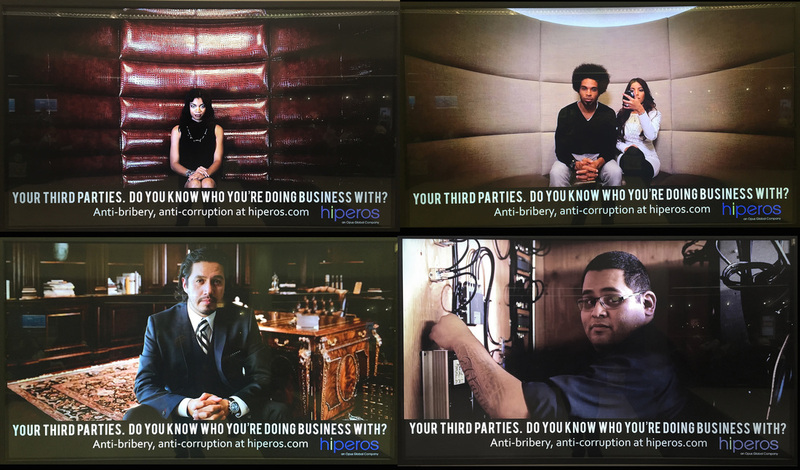 The ad implies that, as a business, you need to be leery of working with third parties. 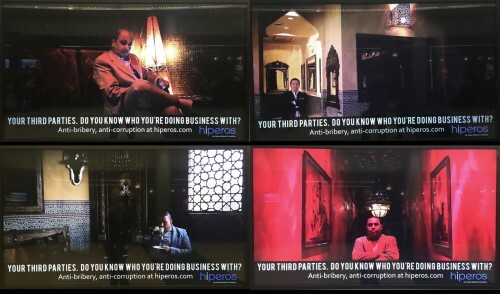 Of particular risk is exposure to bribery or corruption. Whom can you trust? Who are the people you should be afraid of? Who might be corrupt? 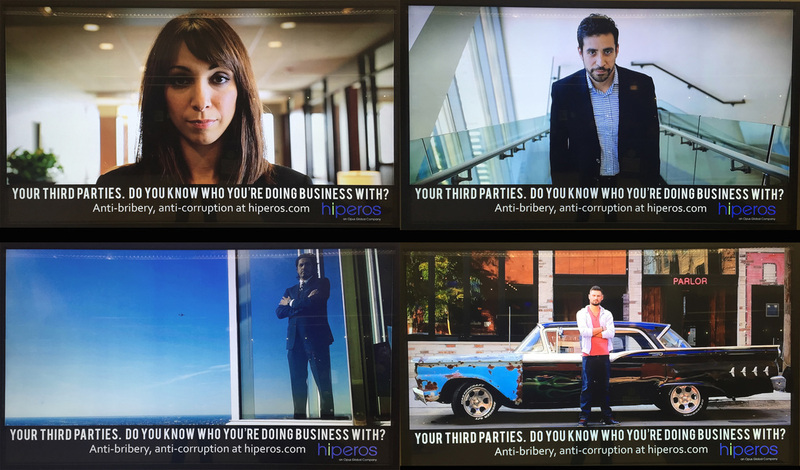 I took a photo of each of the ads as they cycled through. 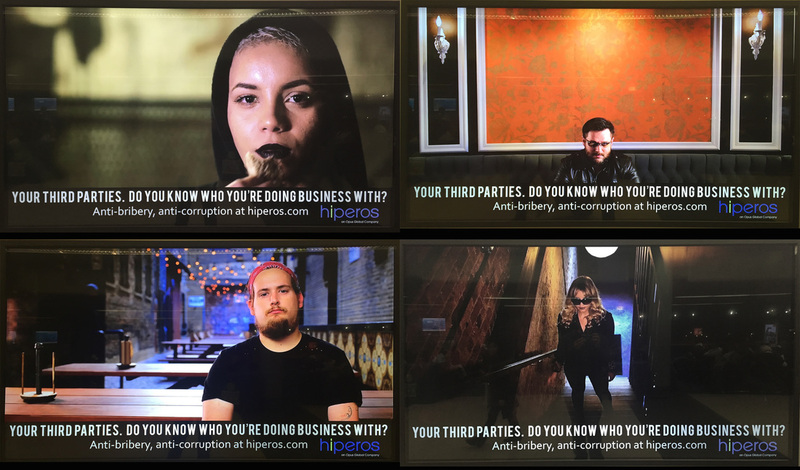 Turns out, the company portrays people you should be worried about as mostly non-white or not-quite-white. Who is untrustworthy? Those that seem exotic: brown people, black people, Asian people, Latinos, Italian “mobsters,” foreigners. Of course, this company’s advertising alone could not powerfully influence whom we consider suspicious, but stuff like this — combined with thousands of other images in the news, movies, and television shows — sinks into our subconscious, teaching us implicitly to fear some kinds of people and not others. For more, see the original post on sociologytoolbox.com. Todd Beer, PhD is an Assistant Professor at Lake Forest College, a liberal arts college north of Chicago. His blog, SOCIOLOGYtoolbox, is a collection of tools and resources to help instructors teach sociology and build an active sociological imagination. Now, to be fair, Gallup specifies a sampling error of ±4 percentage points. 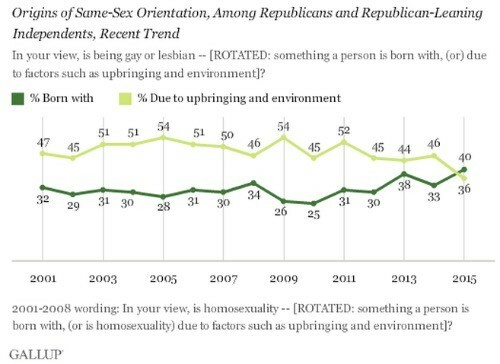 So, they’re 95% confident that at least 47% of Republicans now approve of gayness, but also as many as 55%. 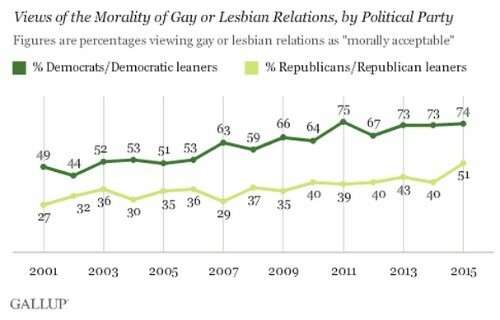 Also, I don’t know what “gay and lesbian relations” means — sexual relations? relationships? — and neither do the pollsters or the respondents, as far as I know, which is some interesting slippery question asking. Still, that’s the data. Here’s some skepticism, just in case you’ve got an eyebrow raised. It’s always a treat to find a good candidate for our series on babies-who-totally-learn-how-to-do-things. In previous editions, we’ve featured a baby rapper, baby preacher, baby worshipper, and two babies mimicking a conversation. These videos are entertaining because they’re babies, but the message their actions send is more than just adorable. They remind us of how deeply cultural we are as human beings. There’s nothing natural about giving CPR. There’s no gene, no evolutionary push for that behavior, no particular brain organization, and no special mix or hormones that can explain why that baby can mimic the steps of cardiopulmonary resuscitation. Instead, that baby is learning. Learning is coded in our genes. We’re deeply and naturally flexible that way, able to learn whatever our particular culture needs and values. Many people make biologically deterministic arguments — ones that draw a causal arrow from our biology to our behavior — but that’s usually wrong. More often, we are biologically designed to be contingent, our behavior is naturally dependent on whatever it is in the world that we encounter. With the power of Google image search, you can follow this image around the Internet, where it has been used by a lot of people to illustrate supposedly funny-but-oh-so-true stereotypes, like “Hilarious differences between men and women,” and on pages with sexist aphorisms such as, “A woman worries about the future until she gets a husband; a man never worries about the future until he gets a wife,” and on relationship advice pages, with conclusions such as, “If we understand this basic fundamental, there will be better relationships … steadier ! 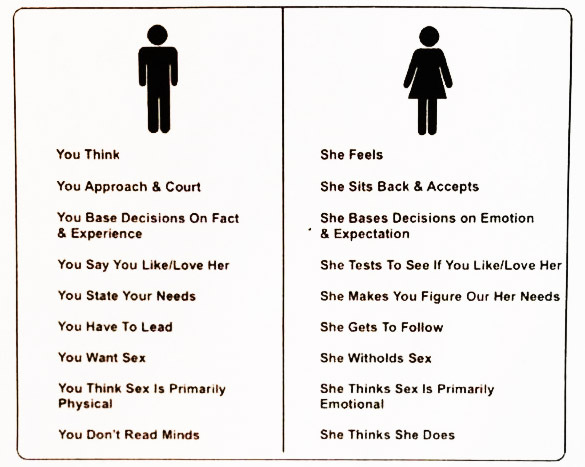 !,” and even “Real, Honest Female Advice” for men who want to “start having unbelievable success with women.” It always has the same typo (“Figure Our Her Needs”). I can’t find an original use, or any serious attempt at educational use, but I’d love to know who came up with it. Philip N. Cohen is a professor of sociology at the University of Maryland, College Park. He is the author of The Family: Diversity, Inequality, and Social Change and writes the blog Family Inequality. You can follow him on Twitter or Facebook. In this Farm Bureau Insurance ad, a father and son paint a room pink and commiserate about how their lives will be ruined by the arrival of a baby girl. 2. …belittle femininity. The stuff girls do is boring and trivial. Only girls would want to do those things. Girls are such a drag! In short, all girls are girly and girly stuff is dumb. I didn’t find it, but I’ll give them the benefit of the doubt; maybe they made the opposite commercial, too. One in which a mom and her daughter cringe over the idea of having to put up with booger-flinging and farting at the table. But that would be equally bad. We don’t know a child’s personality just by anticipating the stuff between their legs. And it’s not true that male and female humans are so different as to enjoy entirely non-overlapping sets of things. In daily life, we recognize each other for the complex and varied people that we are. Think about it. Practically the only place we see stereotypes this retrograde are on TV and in the movies. We’re not “opposite sexes,” but we’re surrounded by the idea that we are. If you stop and think about it, alcohol is just the worst. Almost every one who drinks has experienced the pain of a mean morning hangover (at least once). Also, the experience of being drunk… why is that enjoyable? When drunk you slur your words, it’s hard to think straight, you’re liable to say or do something that will offend the people around you, and you can’t legally drive a car. Why does any of that sound like a good way to spend a Friday night? To a sociologist, the reason people drink alcohol is that they have been socially taught to. That is, we like alcohol because we’ve been taught to overlook the negative side effects or we have redefined them as positive. If that’s confusing, don’t worry. Let’s talk about another drug people abuse (marijuana) and how the sociologist Howard Becker argues we socially construct getting high and being a stoner. An individual will be able to use marihuana for pleasure only when he (1) learns to smoke it in a way that will produce real effects; (2) learns to recognize the effects and connect them with drug use; and (3) learns to enjoy the sensations he perceives. This proposition based on an analysis of fifty interviews with marihuana users, calls into question theories which ascribe behavior to antecedent predispositions and suggests the utility of explaining behavior in terms of the emergence of motives and dispositions in the course of experience. The first point should be pretty obvious. You can’t get high if you don’t inhale when you smoke marijuana (like President Bill Clinton). So the first step to becoming a pot smoker is learning to properly smoke pot. Most often this takes place when an experienced smoker socializes (i.e. trains) a novice smoker in the mechanics of the task. 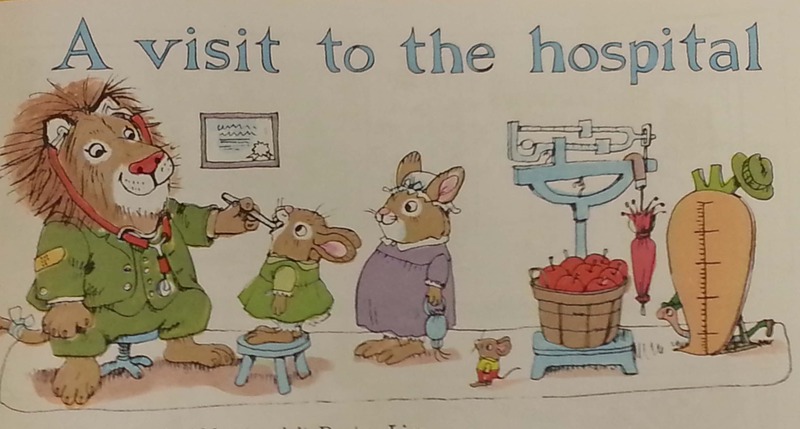 David, the little boy in the movie, had not been socialized to how anesthesia works. Similarly, when you ingest any drug you have to be taught to recognize the effects. So for marijuana maybe that would include heightened senses, food cravings, and possibly a sense of anxiety or paranoia. When you haven’t been socialized it’s easy to go into a panic or ignore the effects altogether. For instance, around 2007 a police officer in Dearborn Heights Michigan stole marijuana from a drug arrest, baked it into brownies, and then consumed the brownies to get high for what he said was his very first time. He then called 911 because he thought he was dying. Becker would likely say that if he had been socialized and knew what effects he should expect, the police officer wouldn’t have likely freaked out and incriminated himself. After you’ve learned to inhale properly, learned to recognize how the substance will alter you, then the last step to becoming a marijuana user is to redefine potentially negative experiences as positive. As we talked about above, smoking marijuana can lead to anxiety, paranoia, insatiable food cravings, hyper sensitivity, confusion, etc. To see an example of this, we need look no further than the comment section under the video I just showed you. What WeBeChillin420’s comment does is reframe a panic attack into a desirable thing. S/he seems to be nostalgic for his or her first time consuming freak out quantities of marijuana. Becker and the scholars he inspired to research marijuana communities further point out that it’s common among smokers to say that “coughing gets you higher.” Actually, coughing after smoking is your body’s way of telling you that you inhaled something it didn’t like. It’s your body literally gasping for air. It seems just as likely that marijuana users could think of coughing as a bad thing or as a sign they inhaled too much. Instead smokers socially construct coughing as a positive and desirable thing. While Becker focused on marijuana, we can extend his ideas to every type of drug. For instance let’s look at caffeine. Coffee and Red Bull are said to be “acquired tastes.” Doesn’t this mean that you have to learn to like them? You have to learn to like to feel a slight jitteriness? What you can take from Becker’s research is that how we think about drugs, how we react to any drug or medicine we ingest, and how we feel about others who’ve used drugs are all social constructs. Nathan Palmer, MA is a visiting lecturer at Georgia Southern University. He is a passionate educator, the founder of Sociology Source, and the editor of Sociology in Focus, where this post originally appeared. A few times on SocImages we’ve been tickled to highlight instances of very young children performing adult behavior. In each (adorable) case, they were great examples of how children learn how to a culturally intelligible adult and particular kinds of ones at that. Our favorites include the baby worshipper, baby preacher, baby Beyonce, baby rapper, and babies learn how to have a conversation. Seriously. Click on every single one of those links. You won’t be disappointed. This one is of a little girl in a Baptist church in Bishkek, Kyrgyzstan mimicking a choir conductor. It’s fantastic. I’m sure you’ll have your own favorite thing about it, but mine is her intensity. Maybe it’s an indication of just how seriously she takes learning. At one time, and in a different way in the modern world, learning to copy adults was a matter of life or death. This must be part of what it means to be a human child even today. But it may also be part of the mimicry. Conducting tends to be a pretty serious business. Maybe she’s just performing seriousness as part of the game, like her heartfelt facial expressions. Either way, it’s a pretty impressive performance and a wonderful example of children’s active involvement in their own socialization. As children, many of us encountered Richard Scarry’s book, What Do People Do all Day? 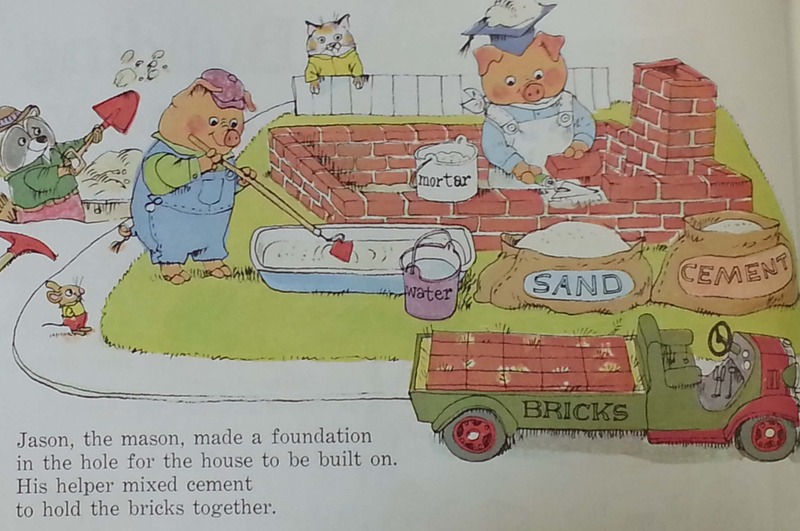 A classic kid’s book, it uses animals to represent the division of labor that exists in “Busytown.” The book is an example of a brilliant piece of analysis by sociologist John Levi Martin. To oversimplify greatly: Martin analyzes nearly 300 children’s books and finds that there is a marked tendency for these texts to represent certain animals in particular kinds of jobs. Jobs that allow the occupant to exercise authority over others tend to be held by predatory animals (especially foxes), but never by “lower” animals (mice or pigs). Pigs in particular are substantially over-represented in subordinate jobs (those with low skill and no authority), where their overweight bodies and (judging from the plots of these books) congenital stupidity seems to “naturally” equip them for subservient jobs. Here, see this additional image from Scarry’s book, showing construction work being performed by the above-mentioned swine. In effect, Martin’s point is that there is a hidden language or code inscribed in children’s books, which teaches kids to view inequalities within the division of labor as a “natural” fact of life — that is, as a reflection of the inherent characteristics of the workers themselves. Young readers learn (without realizing it, of course) that some species-beings are simply better equipped to hold manual or service jobs, while other creatures ought to be professionals. Once this code is acquired by pre-school children, he suggests, it becomes exceedingly difficult to unlearn. As adults, then, we are already predisposed to accept the hierarchical, caste-based system of labor that characterizes the American workplace. Steven Vallas is a professor of sociology at Northeastern University. He specializes in the sociology of work and employment. His most recent book, Work: A Critique, offers an overview and discussion of the sociological literatures on the topic. You can follow Steven at the blog Work in Progress. Cross-posted at Work in Progress.